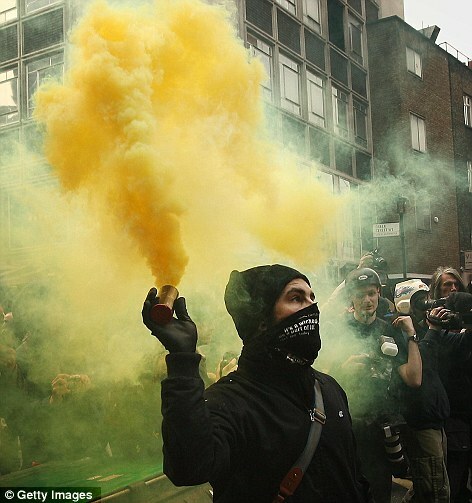 London was just hit by heavy riots as part of a protest against the “deep” and “savage” budget cuts of the Cameron government. This is not the first time the U.K. has endured riots. The welfare lobby, bureaucrats, and other recipients of taxpayer largesse are becoming increasingly agitated that their gravy train may be derailed. The vast majority of protesters have been peaceful, but some hooligans took the opportunity to wreak havoc. These nihilistic punks apparently call themselves anarchists, but are too dense to understand the giant disconnect of adopting that title while at the same time rioting for bigger government and more redistribution. My anarcho-capitalist friends must be embarrassed by the potential linkage with these angry morons. Speaking of rage, Paul Krugman is equally dismayed with Prime Minister Cameron’s ostensibly penny-pinching budget. Summoning the ghost of John Maynard Keynes, he asserts that such frugality is misguided when an economy is still weak and people are unemployed. Indeed, Krugman argues that the U.K. economy is weak today precisely because of Cameron’s supposed austerity. Not surprisingly, the purpose of his argument is to discourage similar policies from being adopted in the United States. Austerity advocates predicted that spending cuts would bring quick dividends in the form of rising confidence, and that there would be few, if any, adverse effects on growth and jobs; but they were wrong. …Like America, Britain is still perceived as solvent by financial markets, giving it room to pursue a strategy of jobs first, deficits later. But the government of Prime Minister David Cameron chose instead to move to immediate, unforced austerity, in the belief that private spending would more than make up for the government’s pullback. As I like to put it, the Cameron plan was based on belief that the confidence fairy would make everything all right. But she hasn’t: British growth has stalled, and the government has marked up its deficit projections as a result. At first I wondered if Krugman was playing an April Fool’s joke, but this is consistent with his long-held views about the magical impact of government spending. Besides, his piece is dated March 25, so I think we can safely assume he actually believes that Cameron’s supposed budget cutting is crippling the U.K.’s recovery. There are two problems with Krugman’s column. The obvious problem is his unwavering support for Keynesian economics. I’ve addressed that issue here, here, here, here, and here, so I don’t feel any great need to rehash all those arguments. I’ll just ask why the policy still has adherents when it failed for Hoover and Roosevelt in the 1930s, failed for Japan in the 1990s, failed for Bush in 2008, and failed for Obama in 2009. But the really amazing thing this is that both Krugman and the rioters are wrong, not just in their opinions and ideology, but also about basic facts. 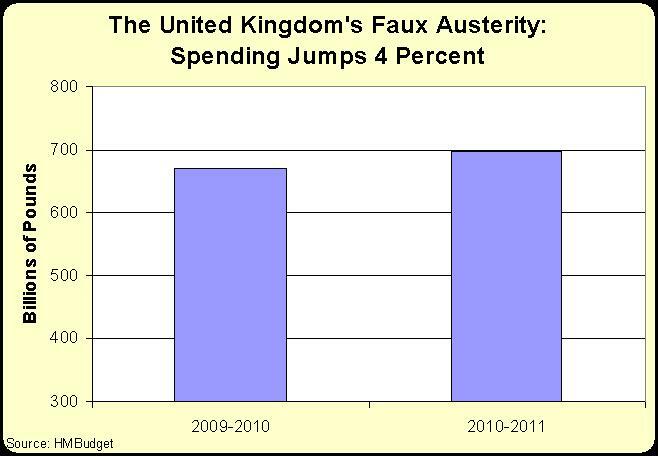 Government spending has skyrocketed in the United Kingdom in recent years. And, as the chart shows, spending is even increasing by about twice as fast as inflation in the current fiscal year. But don’t believe me. Look on page 102 of the U.K.’s latest budget. Maybe that’s austerity to the looters and moochers who think they have an unlimited claim on the production and income of other people, but it’s hard to see how a 4 percent increase can be characterized as “brutal” and “vicious” spending cuts. Moreover, Cameron also has been a disappointment on the tax issue. He left in place Gordon Brown’s election-year, 10-percentage point increase in the top income tax rate. But then he imposed an increase in the VAT rate and implemented a higher capital gains tax. To be sure, Cameron’s budget promises a bit of fiscal restraint in upcoming years, with spending supposedly growing at about 1 percent annually over the next three years. That would actually be somewhat impressive, roughly akin to what Canada and Slovakia achieved in recent decades. But promises of future spending restraint (which may never materialize) surely are not the same as present-day austerity. One final comment. While I obviously disagree with much of what Krugman wrote, he does make some sound points. Many Republicans and Democrats claim that changes in deficits and debt have a big impact on interest, for instance, but Krugman correctly notes that there is no evidence for this assertion. Nations such as Portugal and Greece may face high interest rates, but that’s because investors don’t trust those governments to pay their debts, not because the borrowing of these states is having an impact on credit markets.